Corrado Giaquinto (1703–1765), Medea Rejuvenating Aeson (1760), oil on canvas, 73.7 x 54.6 cm, Metropolitan Museum of Art, New York, NY. Wikimedia Commons. 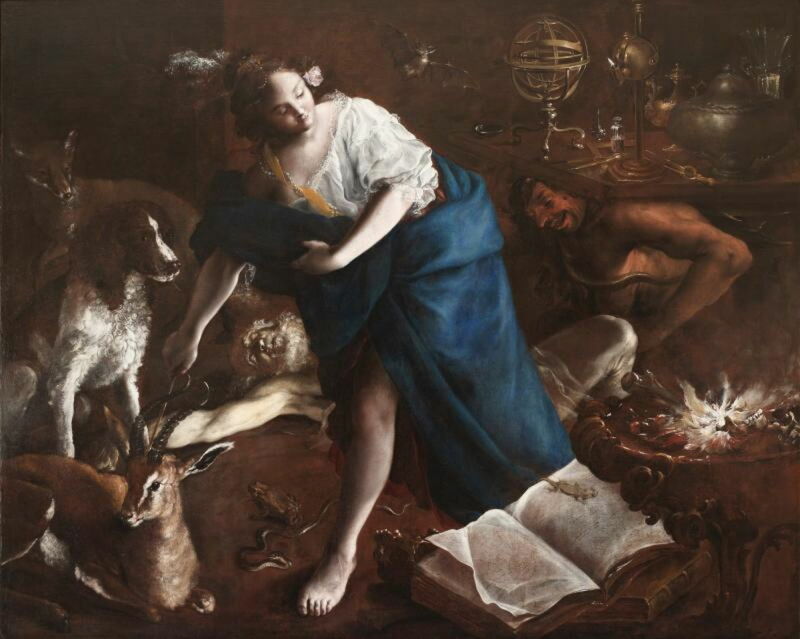 Ovid opened Book 7 of his Metamorphoses with a brief summary of the story of Jason and the Golden Fleece, with emphasis on the role of Medea, the sorceress. He continues his cycle of Jason and Medea with a myth in which Medea is the principal actor, and which explores the unusual theme of rejuvenation by means of sorcery. With Jason and his Argonauts returned to their homes, there is celebratory feasting. But one person is unable to take part: Jason’s father Aeson, who is too old and nearing death. Jason asks Medea, now his wife, if she can transfer some of his own youth to extend his father’s years. Medea chides Jason for suggesting such an act, which Hecate forbids, but then tells him that she will go one better, and try (with Hecate’s consent) to rejuvenate Aeson without using any of Jason’s future life. For three nights Medea engages in rituals to seek Hecate’s help, and the goddess sends down her chariot to help Medea prepare for the task. The sorceress then takes the chariot in her quest for the ingredients required for her magic potion. For nine days and nights, Medea flies round gathering herbs and other arcane substances from the corners of the world. and all luxuriant grasses, and green plants. she filled his ancient veins with rich elixir. years four times ten before that day! With Aeson now forty years younger, Bacchus (who has been watching this from heaven) asks for the recipe so that he can rejuvenate his own nurses. Portrayal of the ‘dark arts’, particularly in a myth in which their outcome was a resounding success, was a contentious if not forbidden subject in Christian Europe. Few artists seem to have attempted this, and this story has been largely ignored by the Masters. Pellegrino Tibaldi (1527–1596), Medea Rejuvenates Aeson (date not known), fresco, dimensions not known, Palazzo Marescalchi, Bologna, Italy. Wikimedia Commons. This monochrome image seems to be the only one available of Pellegrino Tibaldi’s fresco of Medea Rejuvenates Aeson, which he painted in the latter half of the sixteenth century. 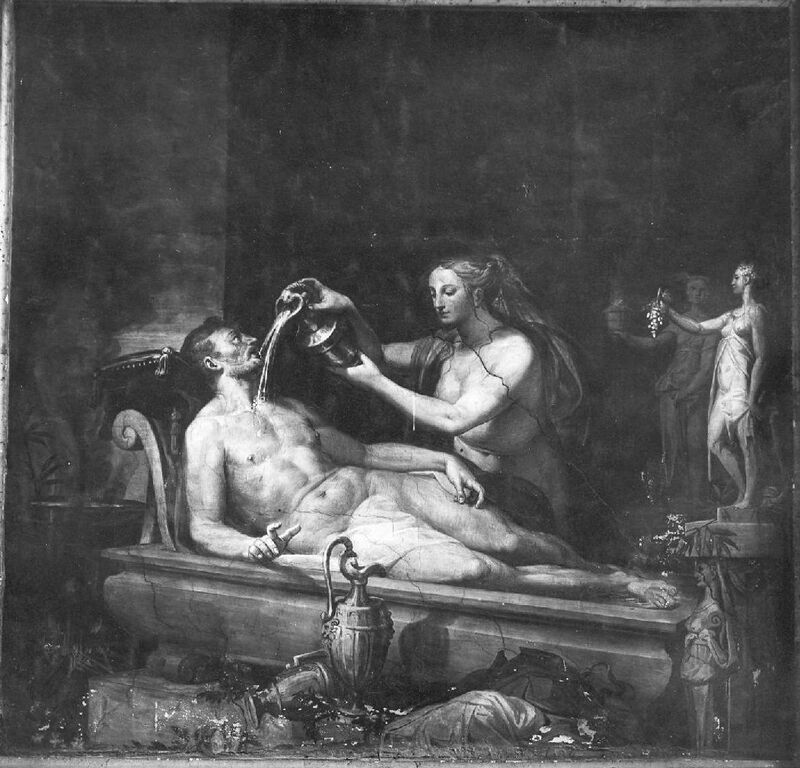 Medea, naked as became traditional in depictions of witchcraft, is shown purging Aeson’s body with water. Pellegrino relocates the event from outdoor turf altars to a more substantial indoor stone trough, around which are scattered jugs and other remnants from Medea’s sorcery. At Aeson’s feet are statues, the most prominent of which shows Hecate. About a century later, Domenicus van Wijnen painted his Medea Rejuvenating Aeson (late seventeenth century), which invokes alchemy as well as witchcraft. Medea, naked again and reclining in Hecate’s golden chariot, points her wand at the body of Aeson lying on the ground, as she casts a spell. Above her, a glass sphere containing a small devil shoots a trail of flame and sparks like a rocket. Bartolomeo Guidobono (1654–1709), Medea Rejuvenates Aeson (c 1700), oil on canvas, 173 x 212 cm, Private collection. Wikimedia Commons. 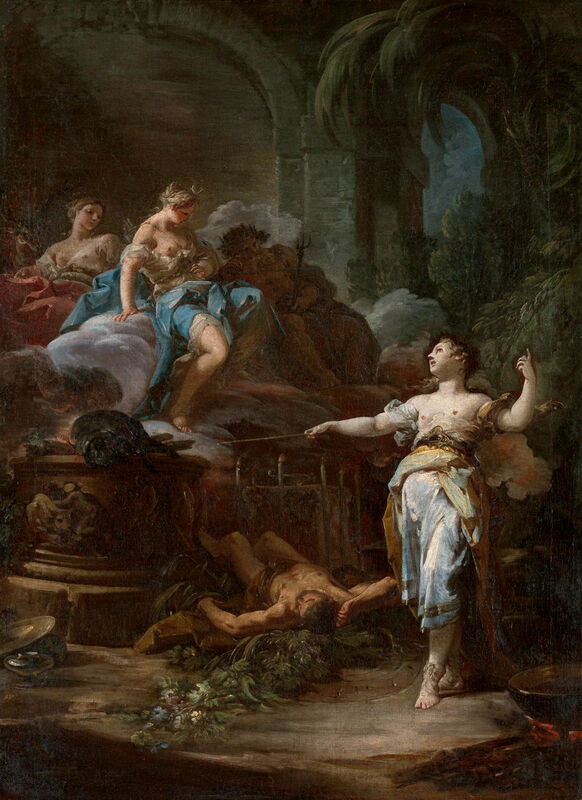 Bartolomeo Guidobono’s Medea Rejuvenates Aeson from about 1700 is more of a puzzle to read, as Medea (now dressed in an unkempt and wild manner) is accompanied by two men. The near-lifeless and pale body of Aeson rests behind her, but a younger man – possibly the rejuvenated Aeson – is materialising under a table. There is now a panoply of symbols associated with magic, including a snake and toad, large tomes of spells on top of which is a lizard, an open fire on a small stand, and an assortment of more normal animals including a dog, fox, and deer. The table in the background has further magical equipment, such as an orrery, and a bat is flying to the right of Medea’s head. Corrado Giaquinto’s splendid Medea Rejuvenating Aeson from 1760 is theatrical in tone. Set outdoors by the arches of a large stone structure, three gods watch Medea work her spells. At the front of the trio is Diane, wearing a crescent moon as a diadem. To the right is Neptune with his spiked crown and trident, and to the left is (probably) Hecate. Medea stands in a dramatic pose as if on stage, in the midst of casting a spell, her wand held over the inert body of Aeson, which rests on a bed of flowers and leaves. Behind that is a more Christian-looking altar, with candles burning at its sides. There is a cauldron heating over an open fire at the bottom right, and the body of a black sheep on a more classical altar to the left. 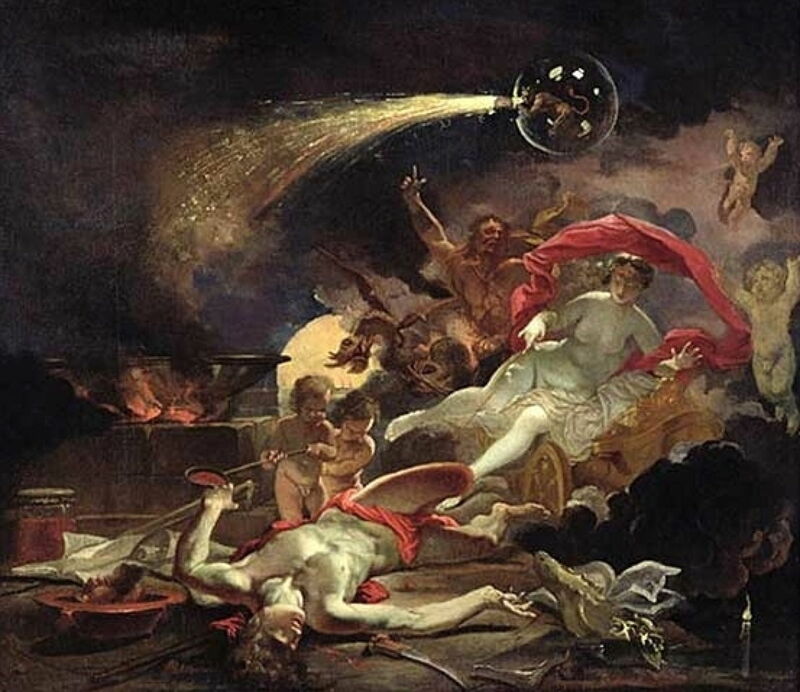 Sorcery and witchcraft became increasingly popular in the late eighteenth century as themes for painting and other arts, with some innovative works by Fuseli and others. Although those painters would have been well aware of this myth, it still doesn’t seem to have made its way onto canvas. Popular interest in ‘gothic’ stories of revivification was inspired by the publication in 1818 of Mary Shelley’s novel Frankenstein; or, The Modern Prometheus, but by this time narrative painting was in crisis, and Frankenstein’s monster does not seem to have been depicted in painting until the twentieth century. By then Shelley’s story had already appeared in plays and movies. None of the Pre-Raphaelites seems to have shown any interest in portraying this particular story, but Frederick Sandys’ painting of Medea (1866-68) comes close. He shows Medea at work, preparing a magic potion. In front of her is a copulating pair of toads, and other ingredients. Behind her, in a gilt frieze, is Jason’s ship the Argo. 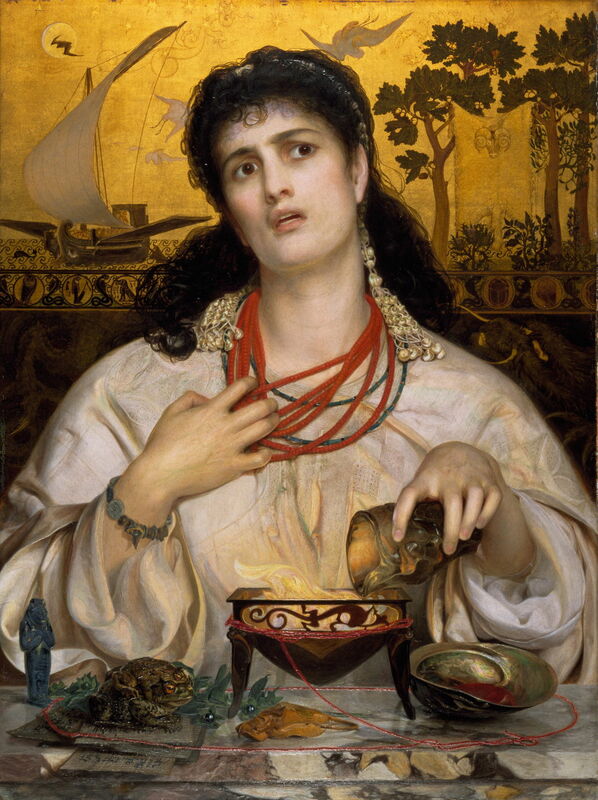 Although Sandys’ portrait is a most effective depiction of Medea, it probably refers not to her rejuvenation of Aeson, but her preparation of potions for Jason. This leaves us with Giaquinto’s faithful account, and the curious failure of nineteenth century painters to respond to this and similar themes, for example in Mary Shelley’s Frankenstein. Posted in General, Language, Life, Painting and tagged Aeson, Guidobono, Jason, Medea, Metamorphoses, myth, narrative, Ovid, painting, Tibaldi, van Wijnen. Bookmark the permalink.